Explore one of the world’s great rivers on this tour of Laos and Vietnam. Visit Southeast Asia’s most charming town, UNESCO World Heritage site Luang Prabang, cruise through rural Southern Laos to visit Khmer ruins, Indochina’s largest waterfall and take a leisurely cycling tour of Vietnam’s fertile Mekong Delta. Finish the tour with a stay on beautiful Phu Quoc Island, one of Southeast Asia’s best kept secrets. Mekong Explorer gives you a firsthand look a village life along one of the most important rivers in this part of Asia. 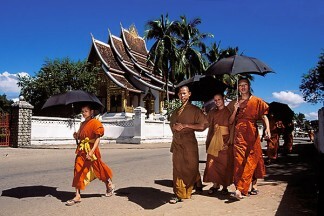 Arrive in Luang Prabang and transfer to your hotel. This this afternoon visit the hilltop temple on Mount Phou Si for a spectacular sunset. Take a full-day boat trip on the mighty Mekong River. Visit local villages, the royal temple at Wat Longkhoun and the nearby Sackarine Caves. Continue your cruise to Pak Ou Caves, filled with thousands of golden lacquered Buddha statues of various shapes and sizes left by pilgrims. Return to Luang Prabang in the late afternoon. Rise early this morning to participate in the morning alms-giving ritual with saffron clad monks. After breakfast your city tour includes the National Museum, Wat Xieng Thong, Wat Sen, and Wat Visun. In the afternoon fly to Pakse and transfer to your hotel. Travel downstream on longtail boat to Champassak. After lunch visit the 10th century temple of Vat Phou. In the evening board your boat for a relaxed cruise downstream, enjoying the tropical sunset from the deck. The boat docks for the night alongside a remote Laotian village. Dinner is served on board. Sail to the village of Huei Thamo and visit the temple of Oum Moung. Continue cruising south through Si Phan Don, the “4,000 islands” and disembark at Khong Island to visit a traditional Laotian Village where traditional way of life has not changed for centuries. Overnight onboard. Visit the small village of Ban Veuthong where you will board a small long-tail boat to Khone Island to see the colorful French colonial houses and old customs post alongside a stone quay. In the afternoon visit Southeast Asia’s largest waterfall, Khong Pha Peng, near the Cambodian border. Return to Pakse in the late afternoon. Transfer to the airport for your flight to Ho Chi Ming City, Vietnam. In the afternoon your tour includes the Reunification Palace, Notre Dame Cathedral, the Central Post Office, Chinatown, Binh Tay Market and the Quan Am pagoda. Drive to Tan An and set out on a cycling tour of the Mekong Delta. Stop for lunch on a small island and visit a workshop of producing local coconut candies. Continue cycling through rural landscape to Phu Tuc, where you will overnight at home stay where your host will assist you in preparing your dinner. Enjoy a short Mekong traditional music performance before dinner. In the morning cycle to Ham Luong Bridge and Cai Mon via Ba Vat. The leisurely ride explores countryside trails with a visit to the quaint church in Cai Mon. Drive to Vinh Long for lunch and continue on to Can Tho. Fly to the idyllic island of Phu Quoc and transfer to your hotel on the beach. Spend a day free to relax on the white sand beaches or explore the island on your own.